Rope cutters - The Quickutter Shaver Cutter eliminates rope and line problems. The revolutionary quicKutter™ rope cutter system eliminates rope and line problems. The system has no moving parts to wear out, and is easy to install. quicKutter™ cuts rope, line and twisted steel line. Available in 3 sizes: Series 16 for shaft sizes 1"- 2", Series 25 for Shaft sizes 2"- 4" and Series 30 for Shaft sizes of 4"- 6"
Vessels operate in waterways where there is an increasing presence of rope and line. The tight coils of rope or line may melt due to friction and enter the bearing sealing off the flow of fresh lubricating water. Rapid failure of the bearing due to overheating. Increased frequency of repairs = increased operating costs = decreased profits. Threat to the welfare of the crew. Stop the rope or line from wrapping around the shaft between the propeller and the bearing carrier. Install the Quickwater quicKutter™ System (Patent Pending). How does the Quickwater quicKutter™ System Work? 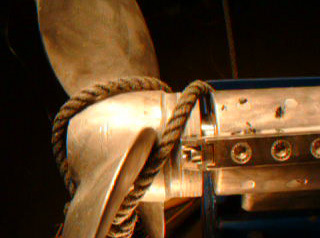 The Quickwater spool is fixed to the propeller between the propeller and bearing carrier to prevent the rope or line from wrapping around the shaft. It provides a surface for the rope or line to wrap around to enable the quicKutter™ blades to continually cut the coils of rope or line as they form and are pressed against the quicKutter™ blades. The quicKutter™ is fixed to the bearing carrier and protrudes out over the Quickwater spool surface ensuring that the clearance does not allow rope or line to pass under the blade and that rope or line is continually cut away to allow a continuous flow of water to exit from the bearing.